The 5900011 Spray valve series provides a repeatable, concentrated coating film in pattern widths ranging from 0.25” to over 2”. The atomized spray process will produce conical (round cap) or fan-shaped (flat cap) patterns with transfer efficiencies in excess of 99%. 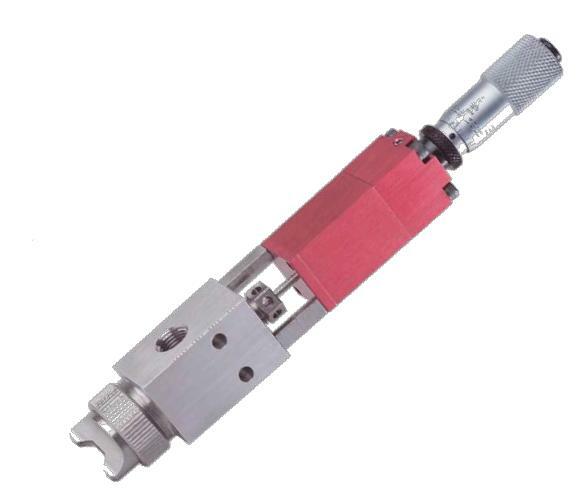 The most current design features a micrometer flow adjustment that makes fine tuning of your process easier than ever. The lower air chamber in the valve, moved by air pressure, forces the needle to retract, just as it does in a front closing valve. While the needle is lifted,fluid flows through the spray head. Simultaneously, as the needle is lifted, air enters the chamber, atomizing the fluid. Once the cycle finishes, air pressure is diverted from the lower half of the valve to the upper. This forces the movable plate behind the needle to force it back down and seat it, assisted by the spring, assuring a sharp cutoff of fluid and air. In summary, spray may be fine tuned by turning the adjustment knob. 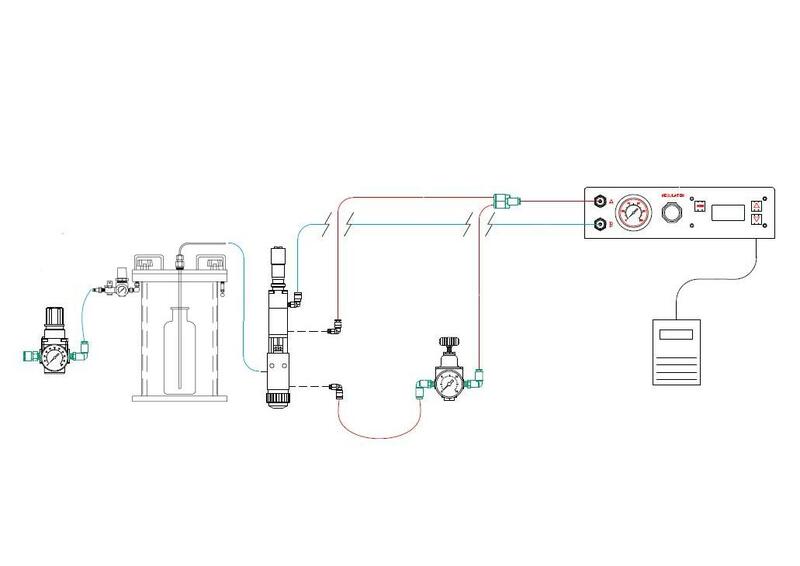 Material deposit and flow rate are controlled by fluid pressure, needle stroke, distance from the valve to work surface and the duration that the valve is opened. 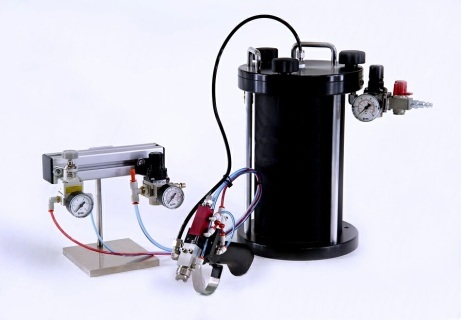 Atomizing air pressure: 1 to 30 PSI (0.1 to 2 bar). Material viscosity: Up to 1000cps. 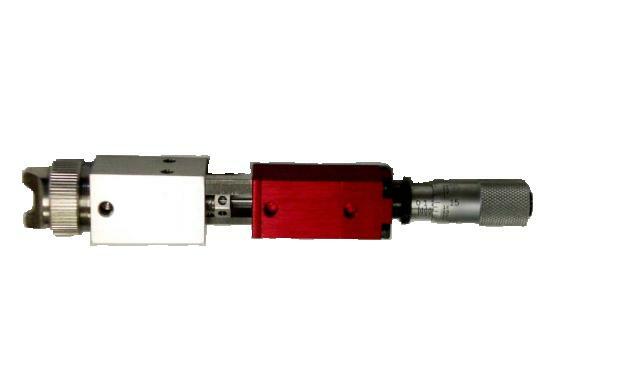 Nozzle diameter: 0.046” (1.17 mm) . Flow rate: Up to 28cc/ml/sec. Operating frequency: Over 400 cycles/min. Operating air inlet: 10-32 thread with push-in fitting for 1/4 tube. Atomizing air inlet: 10-32 thread with push-in fitting for 1/4 tube. Material inlet: 1/8 NPT with compression fitting for 1/4 tube. Includes the 5900011 spray valve (Specify Round or Flat Cap), the 5900011SVC11 digital valve controller with foot pedal activation and 0-15psi atomizing air regulator with gauge assembly, 7080006 Adjustable Valve Stand, and the 7011010-2L 2 Liter Reservoir, also includes regulator stand assembly and all necessary fluid & air, fittings & tubing within system.